mattin posted at mac-tv.de and one particular comment gives a quite comprehensive feedback. Also, there’s a pictured review on a Swiss site, apfelkraft.ch. Oh, and btw., version 1.5 is in the store and we’re working on version 1.6. 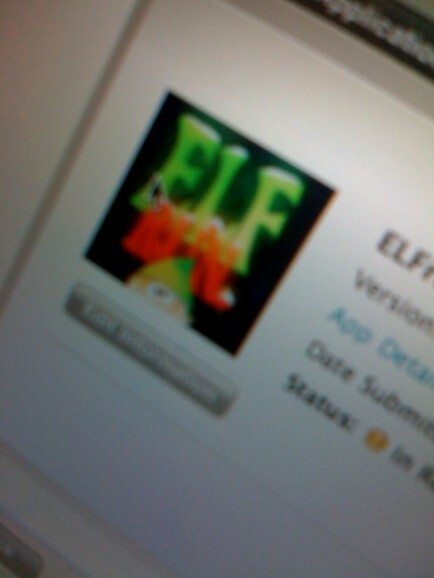 Did I mention the ELFrun review on iphonegamenetwork.com? There’s another video from “ipodtouchlab” who is featuring ELFrun over here with two (simple) levels of gameplay. I’m really wondering whether someone will ever make a movie of the harder ones. 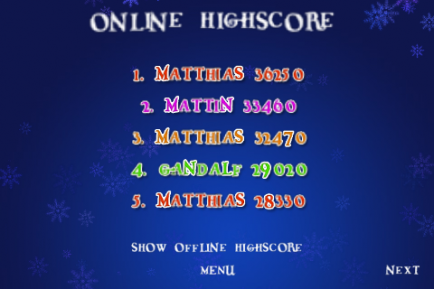 mattin created a new video which shows ELFrun from starting it up on the iPhone to finishing a level (and most of a bonus level). It’s one of the easier levels at the beginning (level 5), so there are not many obstacles and the speed is still pretty low. I guess playing a higher level through a camera is pretty much impossible. ELFrun is also currently featured on TouchArcade.com, hooray! I was a bit scared how fast ELFrun was pirated, though. ELFrun is available in the AppStore. Just follow this link. And now, dear colleagues, please spread the word! Feel free to use one of the shots mattin posted and do some advertising. Greatly appreciated! I nearly shed a tear when mattin finally made it after 12 hours of struggling with code signing and stuff. Imagine that: a 3D artist builds, signs and deploys a whole C++ application using XCode and command line tools by himself. I couldn’t do something like that the other way round. I’m really proud to work with so amazingly talented people. Now keep your fingers crossed that the AppStore people like it as much as we do.